Comics can involve a lot of fighting, and no, that fighting is not all on the page. Look at enough creator twitter feeds, fan reviews, or reader comments, and you will without a doubt hear the sound of growling and barking. Some of this is totally legitimate, particularly since these are turbulent times for comics, after all. But let's face it: Most of the drama isn't about that. 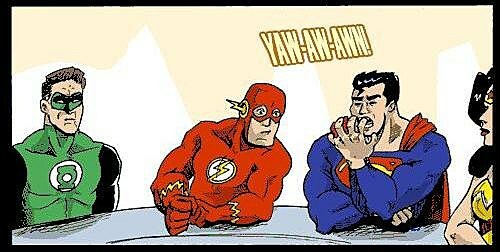 It's about that delicious moment when one comic book nerd looks at another comic book nerd and and says, "You're pathetic." And the battle is on. There's not getting around it: These arguments are silly, hypocritical, and a waste of everyone's time, especially since no one is changing anyone's mind. It's definitely the worst part of nerd culture. In some ways, though, it's also the best.There's a general expectation that geeks, with their peculiar and overwhelming interests in obscure subjects, are all supposed to hang together, stoking each other's enthusiasms and creating a nurturing community which thrives on difference. But honestly, what fun is that? I think the community is richer with the rivalries, the pettiness, and the irrational grudges that it has. For one thing, I love the current feud between vampire fans and the entire rest of the comics geek community. "Buffy," "True Blood," and "Twilight" have all published comics, and while they've got stronger ties to other media, it's not like any vampire out there rivals the number of movies and TV shows made about Batman. They should be part of the group, right? During the 2008 and 2009 San Diego Comic-Cons, legions of "Twilight" fans flocked to the convention and camped out to get a spot in the convention hall where footage from the movies was set to screened, often making it impossible for other attendees to get into earlier panels. 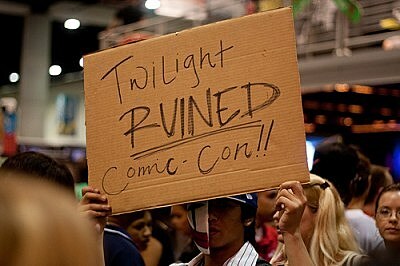 There was a legitimate reason for fans of anything other than "Twilight" to be annoyed. Except for the fact that movies have been blowing the top off Comic-Con for years, and early arrivals who sit through panels they have no interest in to get to ones they do have been a fixture of cons for decades. The numbers are bigger, but the tricks are the same. The resentment wasn't rooted in logistics, it was rooted in people who go for superheroines in fishnets looking down at people who go for vampires that sparkle. The conventions for one might be more deeply entrenched, but there's no way either side can point fingers. And then there are the generational battles. If anything, these are even bloodier than the genre fights, because there's no way to shift ground. 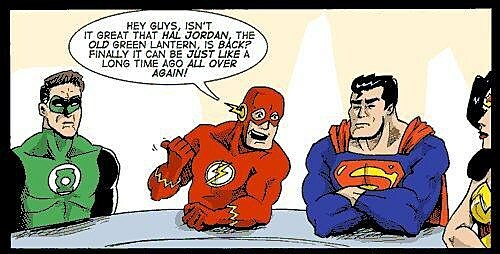 A comic book lover from the '50s and one from the '90s are always going to be fighting over the same territory. Sometimes the battleground is wide, like when they're debating the overall tone of the books. Sometimes they squabble over incidentals, like sidekicks and foes. And sometimes they go close range -- there just aren't that many people that a traditionalist is willing to see "wield the shield." These arguments are based on nostalgia, selective memory, and personal taste, all of which are completely subjective. Which is why fans go at it tooth and nail over them. Whatever era they like is what's best, and everyone else is a philistine, and needs to be exposed as such. I think, though, my favorite kind of nerd snobbery is the kind that emerges over the smallest details. Every message board, every online group, every convention get-together has its taste-makers. There are always a few fans who dominate the discussion, never missing an opportunity to promote an idea, creator, or work that they like, and never holding back when something they don't like is mentioned. These sorts of fans regard their beliefs as facts, not opinions, and those facts shape whatever they touch. Most of us have had the experience of not visiting a website for a few months, only to come back and find the entire nature of the place changed by one or two persistent, passionate, and slightly crazy participants. Sometimes the change is welcome. Sometimes it's not. Either way, it's impossible to fight due to the tidal wave of scorn that rains down on dissenting opinions. I like this kind of fan snobbery best for two reasons. One is the fact that it's a proof of concept. There is no nerd group so small, so specific, and so much in agreement that they can't find one or two things to scoff at each other over. The other is that, while almost any kind of fight is fun to watch, these kinds of fights are the most fun of all. There's something great about seeing a group of people who are incredibly passionate and knowledgeable give in to their enthusiasms. Watching them argue about taste and tradition and innovation, build hierarchies and rivalries, give their reasons for what people should and shouldn't be ashamed of, and seeing a whole group of values coalesce around fictional characters can make the idea of an "all for one and one for all" nerd utopia seem pretty bland.